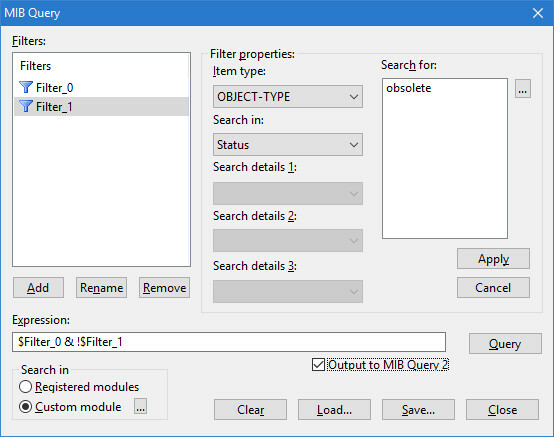 The MIB Query function lets you search a MIB module, a group of MIBs, or all MIB modules for specific constructs, their properties and values that match the given conditions. The conditions are specified by filters, where two or more filter criteria can be combined by using logical operators. 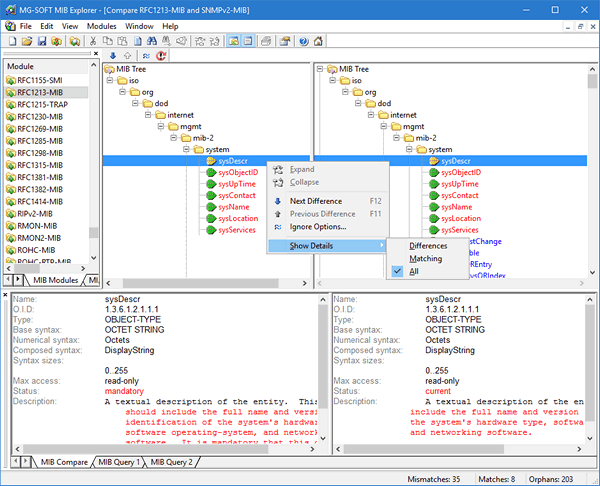 The Compare window lets you display two MIB modules side-by-side and compare the MIB trees and the properties of MIB nodes from both MIB modules. You can view either all differences between compared modules, all matches, or both. Furthermore, the compare function can be configured to ignore the differences you consider irrelevant (like the differences in MIB object descriptions, etc. ), which can be particularly useful when comparing different versions of the same MIB module. 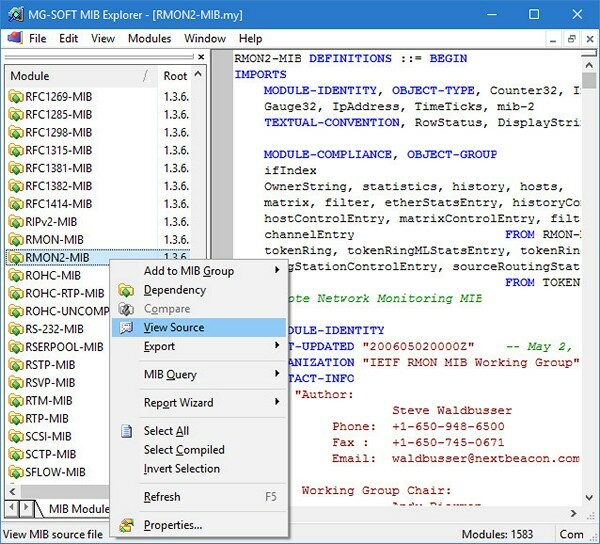 MG-SOFT MIB Explorer lets you select a MIB module and view all MIB modules it depends on (imports definition from), so you can organize dependent MIB modules into MIB groups or export them together to other file formats in order to use or explore MIB modules in external applications. 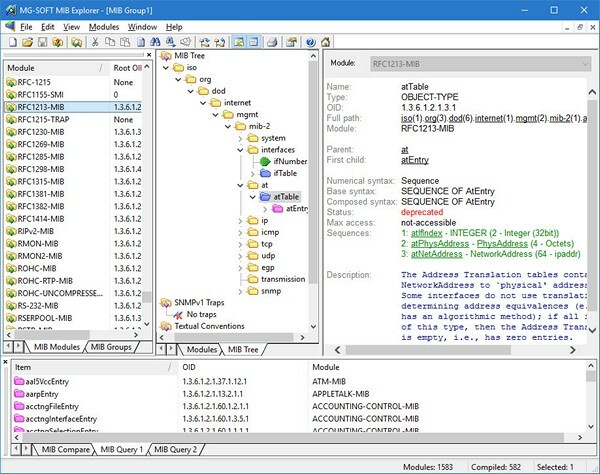 By using the built-in MIB Editor, you can view and edit MIB module definition files directly within the MIB Explorer environment. 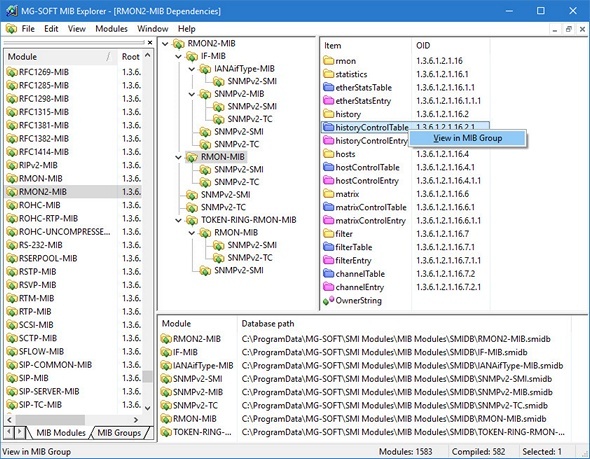 In MG-SOFT MIB Explorer you can view MIB Trees, and explore properties of each SMI construct. The RFC Extract Wizard lets you extract MIB module definitions from RFC (Request For Comments) text files published by IETF. 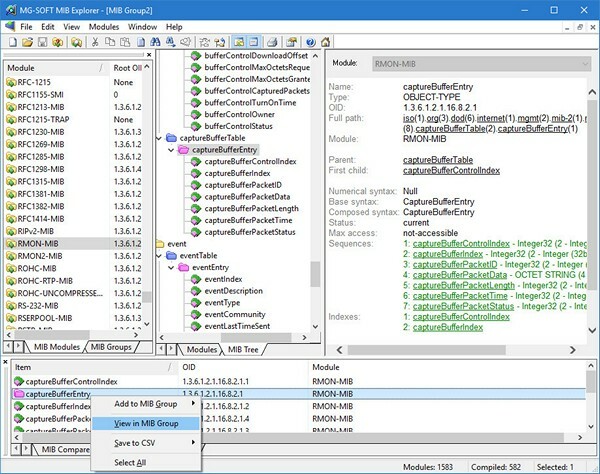 The wizard saves extracted MIB modules to plain ASCII MIB definition files, which can be compiled with MG-SOFT MIB Compiler or any other SMI-compliant MIB compiler. 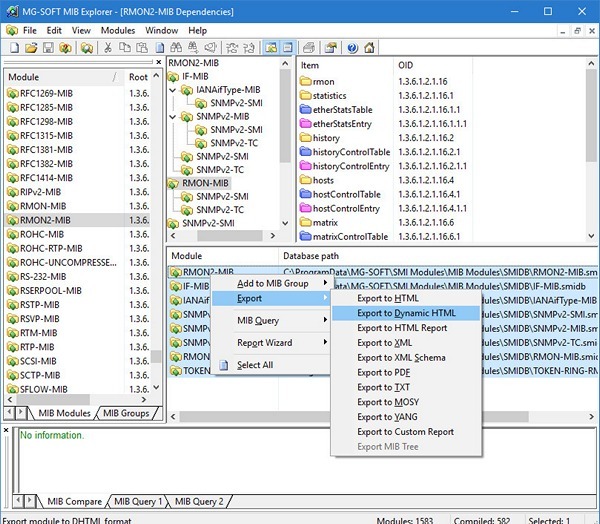 MG-SOFT MIB Explorer lets you export/convert MIB definitions to various formats. The Report Wizard lets you create HTML reports and export MIB definitions to other formats in a few simple steps. HTML reports allow you to explore the MIB tree, SMI definitions, MIB dependencies, and statistics about selected types of MIB objects by using a web browser. The picture shows two screens from the MIB Explorer Report Wizard. You can see a sample report generated by MG-SOFT MIB Explorer for a selected group of MIB files on the Report Examples page.